Adenoids are a common cause of a child being brought to an ENT specialist. The child is evaluated in the ENT clinic. In our ENT clinic in Trivandrum, we do a procedure known as DISE – Drug induced sleep endoscopy to identify the level and degree of obstruction. An adenoidectomy is a surgical procedure to remove your child’s adenoids. 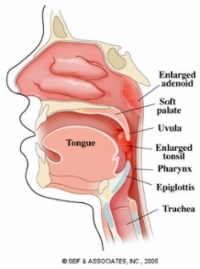 The adenoids are two small clumps of tissue that are located in the back of the nose, high in the throat. Sometimes adenoids swell up. When they swell, they can make breathing difficult, add to congestion, increase the risk of ear infections, and cause sleep problems. Removing the adenoids can help to reduce these risks and symptoms. Damage to other structures or organs. Changes in your child’s sense of taste. Changes in your child’s voice. Severe pain in your child’s throat, ear, neck, or jaw. Up to 2 hours before the procedure – your child may continue to drink clear liquids, such as water or clear fruit juice. 8 hours before the procedure – have your child stop eating foods. 6 hours before the procedure – have your child stop drinking formula or milk. 4 hours before the procedure – stop giving your child breast milk. 2 hours before the procedure – have your child stop drinking clear liquids. Changing or stopping your child’s regular medicines. This is especially important if your child is taking diabetes medicines or blood thinners. Taking medicines such as aspirin and ibuprofen. These medicines can thin your child’s blood. Do not give your child these medicines before the procedure if your child’s health care provider asks you not to. Your child may be given antibiotic medicine to help prevent infection. Ask your child’s health care provider how your child’s surgical site will be marked or identified. Your child’s health care team will wash or sanitize their hands. Your child’s skin will be washed with soap. An IV tube will be inserted into one of your child’s veins. A medicine to help your child relax (sedative). A medicine to numb the area (local anesthetic). A medicine to make your child fall asleep (general anesthetic). A device will be used to hold your child’s mouth open. The surgeon will remove your child’s adenoids. The surgeon may use suction, scraping, or burning (cautery) to remove your child’s adenoids and to control the bleeding. The procedure may vary among health care providers and hospitals. Your child’s blood pressure, oxygen, and temperature will be monitored until the medicines he or she was given wears off. Your child will be given medicine for pain. Your child may be given antibiotics. Any allergies your child has. All medicines your child is taking, including vitamins, herbs, eye drops, creams, and over-the-counter medicines. Any problems your child or family members have had with anesthetic medicines. Any blood disorders your child has. Any surgeries your child has had. Any loose teeth your child has. These may be removed during the procedure. We hope this article was useful to you. In case of any doubt, you can contact your ENT specialist at our ENT clinic in Trivandrum.